"Minimum water temperature is normally 15 degrees Celcius"
Eaglehawk Neck in Tasmania has the reputation as having some of the best diving in the World, let alone Australia. 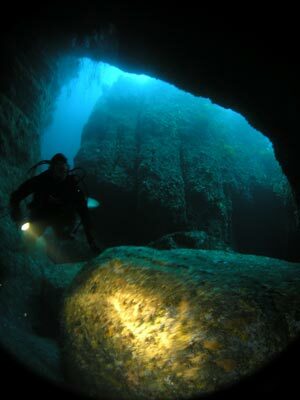 Until early 2008 I had never dived there but in February 2008 Kelly and I travelled again to Tasmania to specifically do some diving. Eaglehawk Neck was the main place that we decided we wanted to dive. 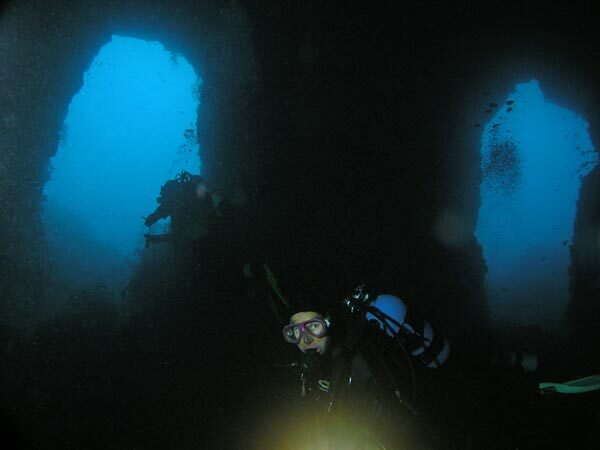 We also returned again with our dive Club, St George Scuba Club, in March 2009. Eaglehawk Neck is located to the south-east of the capital Hobart. It is only an hour or so drive from the city (and less from the airport). The whole of the Tasman Peninsula, the area to the south of Eaglehawk Neck, is one of the most spectacular locations that you will see anywhere in the World. 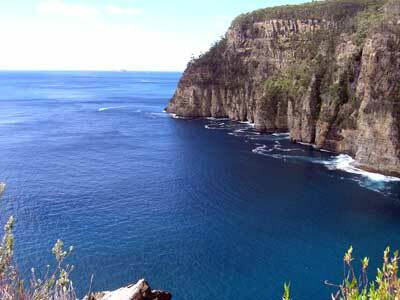 The cliffs rise vertically out of the water and apparently are the highest in Australia. The terrain above the water continues below the water. 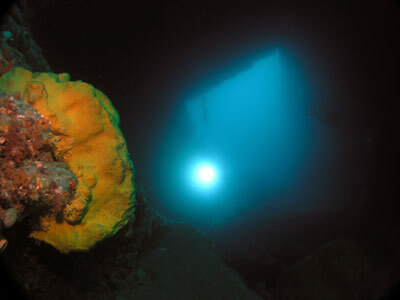 The best dive sites are located to the south of the boat ramp/wharf at Doo Town (in itself an interesting place where every house has a name - eg Zan A Doo, Do It). This is only a few minutes drive from the Eaglehawk Neck "town centre" (not that there are any shops at all) and the Eaglehawk Neck Dive Centre shop. From the wharf, you head out to sea and south to Waterfall Bay. It only takes a few minutes as there is less than five kilometres to travel. This is a large bay that has some shear walls and (when it is wet), a waterfall. To the south of this is the headland, Waterfall Bluff, and south of this is a small inlet. 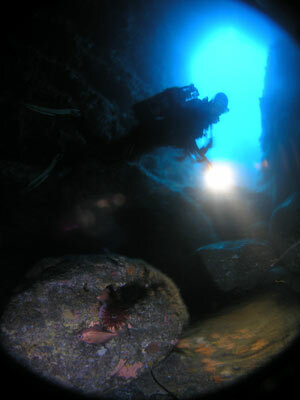 This is the location of Cathedral Caves, one of the best dive sites at Eagelhawk Neck. Head to a GPS Reading of S43° 03' 49.4" E147° 57' 17.3". Note that this GPS reading is WGS84, not the normal GPS Datum used on my site (read the GPS Page from the left menu if you do not understand this). The dive boats do not anchor here but tie up to ropes attached to the north and south walls (if they anchored, they may swing and hit the walls of the inlet). Below the boat the depth is about 22 metres. There are lots of large boulders here on a rocky bottom. The area to the west is called Cathedral Dome. Cathedral Caves is not just one cave, but a multitude of caves, tunnels and arches. There are at least a dozen separate (but mostly connected) caves and tunnels here. Once you get to the bottom you will see that to the north there is a shear wall. To the left and west there is a large arch, Cathedral Arch. This leads right through Waterfall Bluff to the mouth of Waterfall Bay. As you swim towards the arch the depth comes up a little. You will see that there is another opening to the south-west. This tunnel leads to Skull Cave. The depth here is about 18 metres. 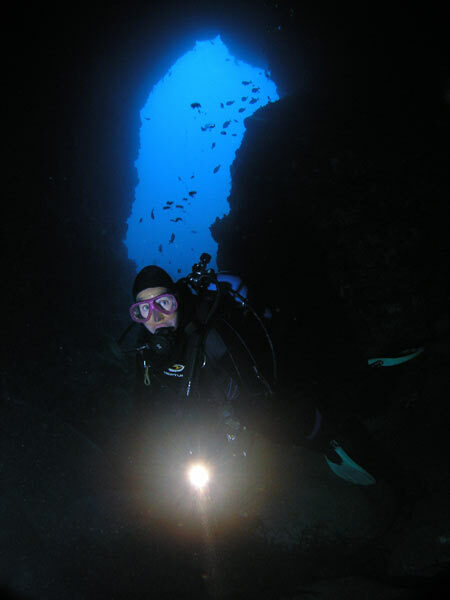 Skull Cave has at least six exits that divers can use. Two on the northern side go to Waterfall Bay and the main southern one goes back to Cathedral Dome. The ones to the west and south west lead further into the cave system. The western one takes you to another spot that has five tunnels leading off it. One goes to the outside in Waterfall Bay and the western one is the main one. This leads to the Catacombs. The Catacombs has a large number of tunnels leading off it, but only three go anywhere. One is the Backdoor that again leads to Waterfall Bay. Another is the one you have come in on and the third leads back to the same spot via a an upsidedown U. We take this one and end up back in the five way cave. We then go via the eastern (south-eastern) tunnel back to the Skull Cave. This tunnel is very dark and is called Revelation Bend. It is very dark and quite narrow. Back in Skull Cave there are four options of the six tunnels to pick from. We go down the south-eastern one. This is very dark and even narrower than Revelation Bend. It is also quite low in one spot. About two thirds of the way along you can go east to Cathedral Dome, but we continue on and squeeze through to Cathedral Dome. From here you can go back to Cathedral Arch for some more photos or examine the area back to the boat's location. There are also more caves but you need very calm water for them. You can do your safety stop on the walls of the bay, looking at the growth. 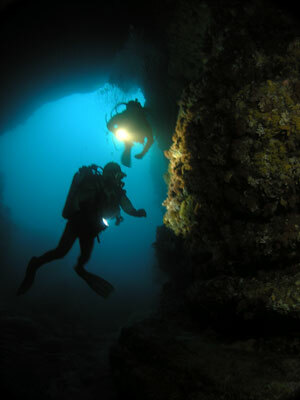 This is a brilliant dive, one of the best sites I have ever dived. 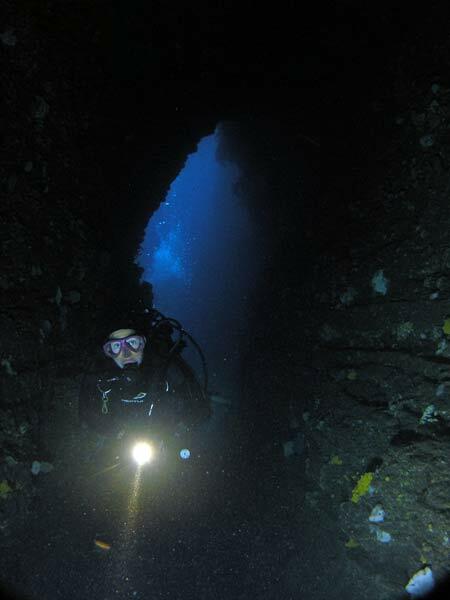 We dived here in February and it was 17°C with at least 20 metres visibility. Worth doing many times.